Figure 1. Filter-feeding organisms have penetrated the quartz sands creating vertical to subvertical burrows. The displaced sand now lies adjacent to the opening of the burrow. The vertical nature and spacing of these tubes would limit the extent of bioturbation. Only through a large population of organisms would the horizontal sedimentary fabric be completely removed. Diameter of the larger sand piles is approximately 10 cm. These particular traces would fall into the Skolithos Ichnofacies. This setting is a modern subtidal lagoon located in St. Andrews State Park, Panama City Beach, Florida. The bioturbation of sediments by trace makers is often perceived by naturalists as a process requiring extensive periods of time. Little experimental work has been conducted to either support or refute such a concept. However, recent laboratory analysis indicates that the bioturbation of marine sediments can occur within short periods of time. However, recent laboratory analysis indicates that the bioturbation of marine sediments can occur within short periods of time. Figure 2. Mobile deposit feeders have left a trail on top of the quartz sand as they plowed through the sediments looking for food. These types of trace makers moving through the sediment substrate would rapidly bioturbate the sands and destroy any laminations in the sediments. These traces would fall into the Cruziana Ichnofacies. The width of view is approximately 60 cm. The setting is a modern subtidal lagoon located in St. Andrews State Park, Panama City Beach, Florida. “Skolithos Ichnofacies (shifting substrates)—Lower littoral to infralittoral, moderate to relatively high-energy conditions most typical. Associated with slightly muddy to clean, well-sorted, shifting sediments subject to abrupt erosion or deposition. Higher energy increases physical reworking and obliterates biogenic sedimentary structures, leaving a preserved record of physical stratification. Generally corresponds to the beach foreshore and shoreface; but numerous other settings of comparable energy levels also may be represented, such as some estuarine point bars, tidal deltas, and deep-sea fans. the challenge to explaining highly bioturbated sediments no longer requires deep time—it depends on the availability and types of trace makers. 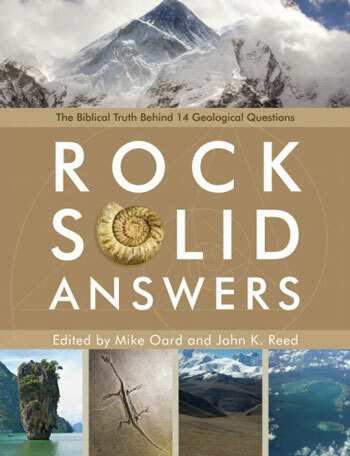 If we are consistent in applying the uniformitarian philosophy to the rock record then we should expect a high level of bioturbation for almost all of the sediments deposited in a former marine setting, especially if that environment existed with little to no change for thousands to millions of years. Counter to that conceptualization, some diluvialists have predicted that we should expect little sediment bioturbation due to the high-energy conditions associated with the Genesis Flood.5 Within this diluvial interpretation it could be postulated that the rapid deposition of sediments, one atop another, would leave little time for trace makers to move in and stir them. However, neither perspective is consistent with the actual rock record (figure 5). Figure 3. 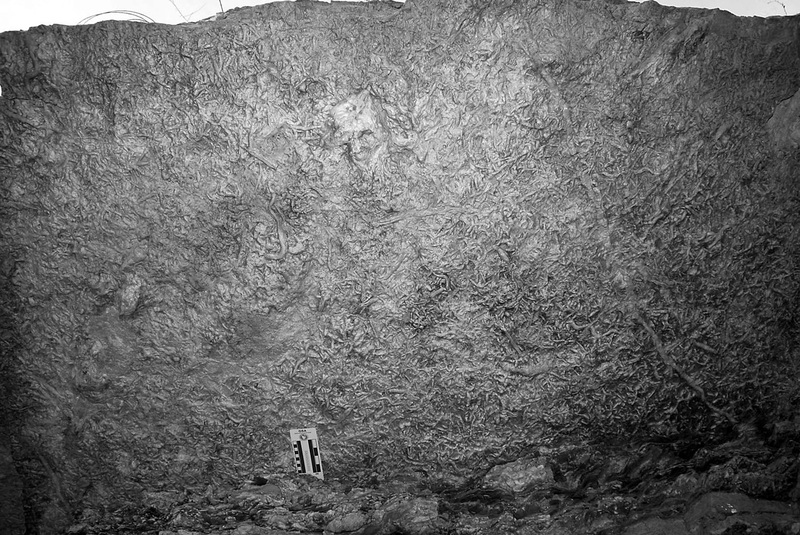 Skolithos traces dominate this exposure of the Meridian Sand from Campbell Mountain, Alabama. Note the vertical to subvertical traces in the sand filled by gray clay. Conditions were optimum for trace maker activity and the amount of time necessary to create these traces could be measured in months, not years or decades. Sediment deposition during this portion of the Flood was low enough to allow the bioturbation of the sediments and the destruction of any preexisting sedimentary fabric. Scale in inches and centimeters. Figure 4. 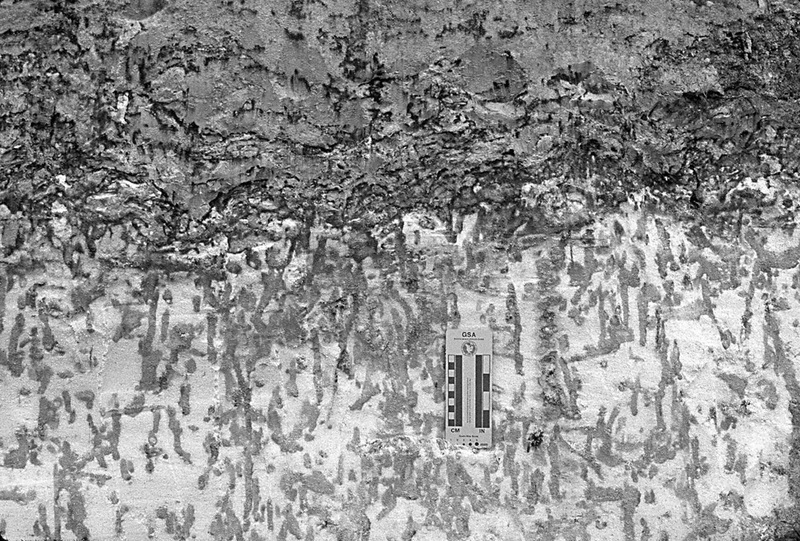 This image shows Cruziana traces created as casts on the base of a sandstone layer.7 This type of sediment stirring activity would rapidly destroy any preexisting sedimentary fabric. This outcrop is located alongside Lookout Mountain, Georgia (USA). Scale in inches and centimeters. Figure 5. Sidewall along Providence Canyon, Georgia (USA). Uniformitarians assert that these sands were deposited in a mixed-energy barrier island setting cut by tidal inlets.8 Some of the canyon sidewalls display a few sub-vertical Ophiomorpha traces but many more do not. This sidewall exhibits no evidence of any bioturbation where it would be expected within the hypothesized uniformitarian setting. 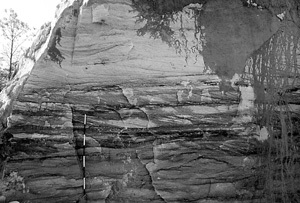 The cross-bedding displayed in the sands indicates this was a high-energy depositional environment. While some trace makers were present in this energetic setting, they had little opportunity to bioturbate the sediments due to rapid deposition and the reworking of the sediments during the later stages of the Flood. Scale in 15-cm divisions. The presence or absence of trace fossils and bioturbated sediments is dependent on many different factors including trace maker population density, sediment firmness, salinity, pH, food and oxygen. Also, the behavior of trace makers facing abnormal environmental stress should be considered. 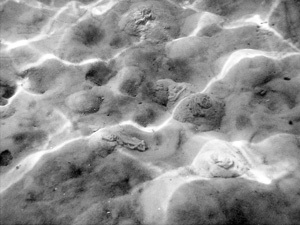 For example, Woodmorappe6 proposed a unique idea suggesting that rapid bioturbation could occur concurrently in several vertical tiers if the stressed ichnofauna were protected from sediment compaction and provided an aerobic environment. 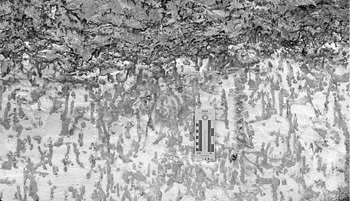 Many different factors would go into determining if this occurred or if the traces were rapidly produced as individual layers. There are many reasons why sediments may or may not have been bioturbated within a proposed diluvial setting and the site-specific paleoenvironmental factors should be identified. Recent laboratory experiments document that the bioturbation of marine sediments can occur over a short period of time depending on the type and population density of trace makers. For uniformitarians, the lack of any stirred sediment requires that they appeal to punctuated catastrophic events. 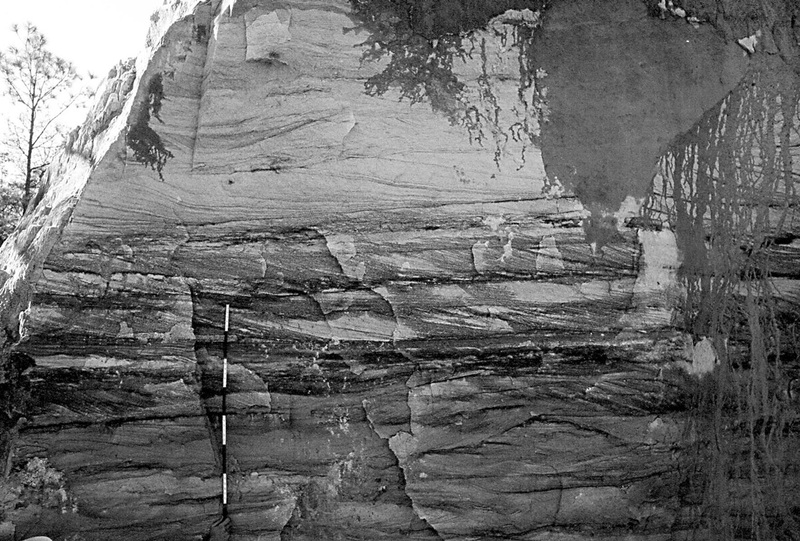 Such events do not eliminate their reliance on deep time assumptions—the vertical rock record should exhibit layers of intense bioturbation interrupted by nonbioturbated sedimentary events followed by intense bioturbation. However, this is not typically found in the actual rock record. As diluvialists, we can use trace fossils to help define the probable geologic conditions in which the traces were created relative to the Flood setting. 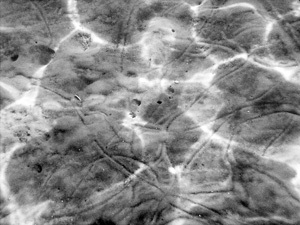 Knowing the differences in the rate of bioturbation between the Skolithos and Cruziana ichnofacies allows diluvialists to possibly estimate the time period in which these traces were formed. Where no bioturbation has occurred, we need to determine the factors that prevented trace makers from stirring those sediments. The importance of this new experimental work cannot be overemphasized as the challenge to explaining highly bioturbated sediments no longer requires deep time—it depends on the availability and types of trace makers. A large population of filter-feeding or mobile sediment-feeding animals could easily bioturbate marine sediments within the short time frames of the global Flood of Genesis. The lack of any bioturbation should direct us to other important considerations why sediment stirring did not occur. Are soft-sediment trace fossils (ichnofossils) a time problem for the Flood? Cowart, J.H. 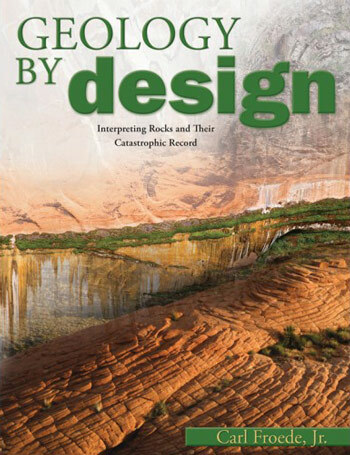 and Froede, C.R., Jr., The use of trace fossils in refining depositional environments and their application to the creationist model, Creation Research Society Quarterly 31:117–124, 1994. 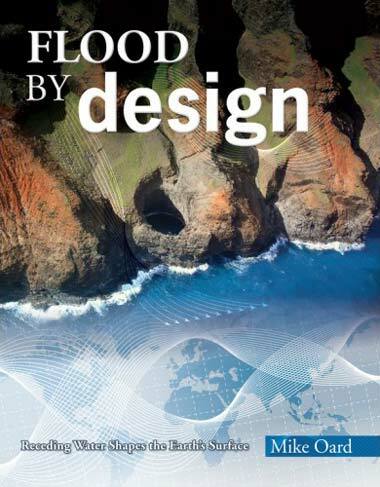 This is an overview of the field of ichnology as it relates to the global Flood of Genesis. Return to text. Gingras, M.K., Pemberton, S.G., Dashtgard, S. and Dafoe, L., How fast do marine invertebrates burrow? Palaeogeography, Palaeoclimatology, Palaeoecology 270:280–286, 2008. Return to text. Gingras et al., ref. 2, p. 280. Return to text. MacEachern, J.A., Pemberton, S.G., Gingras, M.K. and Bann, K.L., The ichnofacies paradigm: A fifty-year retrospective; in: Miller, W., III. (Ed. 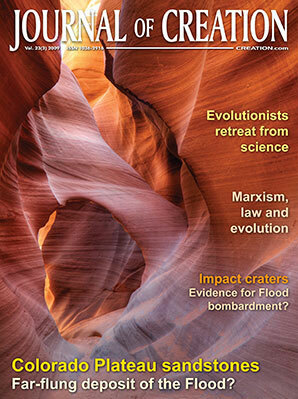 ), Trace Fossils: Concepts, Problems, Prospects, Elsevier, New York, pp. 52–77, 2007; p. 59. Return to text. Anonymous, Burrowing rates, Geoscience Newsletter 17:2, 2009. Return to text. Woodmorappe, J., Are soft-sediment trace fossils (ichnofossils) a time problem for the Flood? Journal of Creation 20(2):113–122, 2006. Return to text. Froede, C.R., Jr. and Cowart, J.H., Dougherty Gap: evidence for a turbidity current paleoenvironment, Creation Research Society Quarterly 32:202–214, 1996. Return to text. Donovan, A.A., Sedimentology of the Providence Formation; in: Reinhardt, J. (Ed. 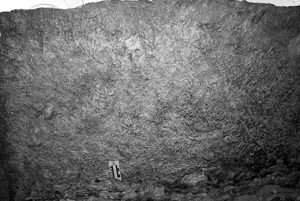 ), Stratigraphy and Sedimentology of Continental Nearshore and Marine Cretaceous Sediments of the Eastern Gulf Coastal Plain, Georgia Geological Society, Atlanta, GA, pp. 29–44, 1986. Return to text.